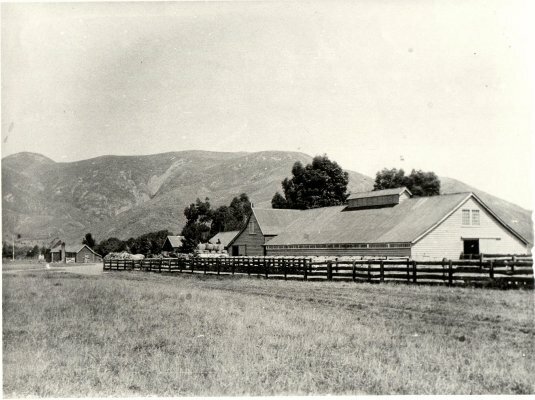 Description A black and white photograph showing the Flaxbourne woolshed as it was in Charles Clifford's day. Information as typed by Norm Brayshaw: "The wool shed at Flaxbourne station in Clifford's day - this building is still standing at Ward today  on the property of Mr. E.M.P. Loe, The Homestead, Ward. According to Mr. H.H. Vavasour this shed had 28 stands, 14 on each side for blade shearers. Machines were installed in the 1890s, e.g. 1895. Wool was loaded into waggons and taken to the ward Beach and there lightered out to a ship off shore - often the s.s Wakatu. The building at the end of the shed is a small store." Copied by Norm Brayshaw in 1959 from a photograph supplied by J. Wiblin at Dalgetys, Blenheim. Includes a negative. There is a copy of this photograph in the same packet.